PROVO – BYU fell to No. 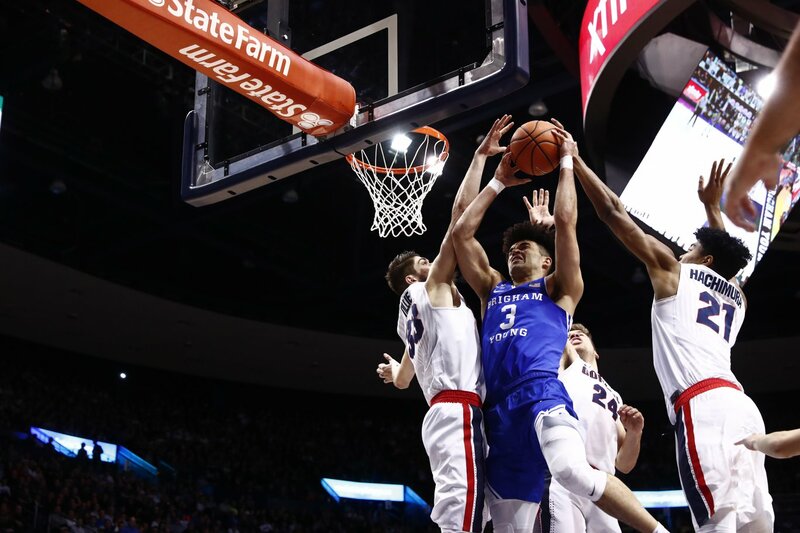 6 Gonzaga 79-65 in the last regular season game of the season Saturday night at the Marriott Center. Yoeli Childs led the Cougars on offense with 19 points and eight rebounds. Elijah Bryant followed with 16 points, coupled with four rebounds and three assists. Jahshire Hardnett tied his career-high of two 3-pointers and added 11 points altogether. A Hardnett 3-pointer was the first basket of the game, putting the Cougars up 3-0, but Gonzaga went on to score two more baskets, taking a 4-3 advantage. After a jumper from Childs, the Bulldogs went on a 16-3 run, putting BYU behind by double-digits, 20-8 with 12:51 remaining on the clock in the first half. The Cougars brought the score within six points after an 8-0 run, 26-20 with 8:43 left, but Gonzaga capitalized on BYU fouls and again increased their lead to double-digits, 32-22. Back-to-back 3-pointers from Bryant brought the Cougars within two points with 2:17 to go in the first half, 38-36. The Bulldogs closed out the first half with a 3-pointer and the Cougars went into halftime behind, 43-38. At the end of the half, BYU was shooting 48 percent from the field while the Zags were shooting 57 percent. Gonzaga opened up the second half with a three-pointer making the score 46-38. The Bulldogs continued to push their lead as they increased it to double-digits at 52-41. Gonzaga quickly took control of the game going up by 21 points with 9:00 left on the clock, 69-48. A 9-4 run for the Cougars brought the score within 14 points, but ultimately the Bulldogs took the win, 79-65. 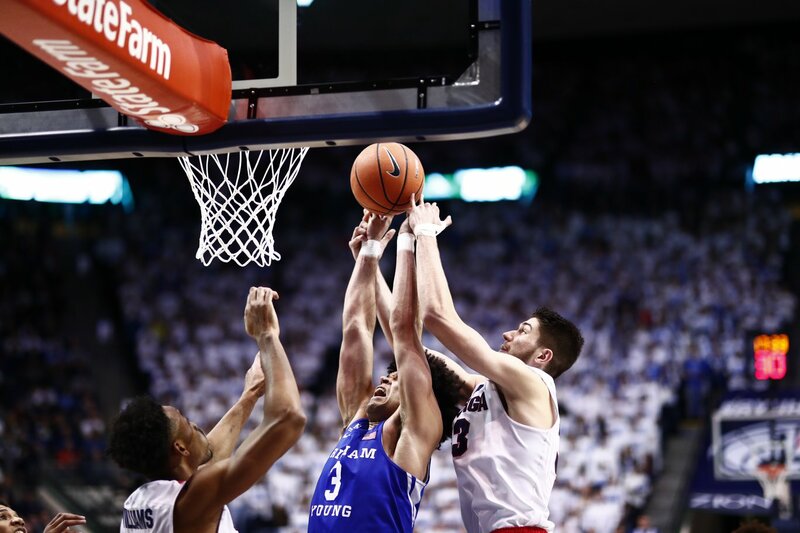 At the conclusion of the game, BYU shot 38.6 percent from the field compared to the Zags 55.4 percent. The Cougars will now prepare for the West Coast Conference Championships in Las Vegas. The quarterfinal round begins on Saturday, March 2. Yoeli Childs scored 19 points for his 29th game in double-figures. He also grabbed eight rebounds and had one block. Elijah Bryant contributed 16 points, 4 rebounds, 3 assists and 2 steals. He scored two treys, giving him multiple 3-pointers in 23 games this season. Jahshire Hardnett recorded his sixth career game with double-digit points, scoring 11. He also tied his career-high two 3-pointers in a single game. In the first half, BYU shot 48.4 percent from the field, 50.0 percent from the 3-point line and 66.7 percent from the charity stripe. At the conclusion of the game, the Cougars shot 38.6 percent from the field, 30.0 percent from beyond the arc and 68.2 percent from the free-throw line. The Bulldogs shot 55.4 percent from the field, the highest percentage a team has shot against BYU this season. The Marriott Center had a sell out crowd tonight with 18,987 in attendance.